We were so lucky to be invited to Beckleberry’s to sample their fabulous food and ice cream! There’s plenty of good reasons to go to the Metro Centre. Sometimes I go to shop, sometimes to watch a film, sometimes I go because it’s raining and I’d rather walk around indoors than try to get to different shops on the Newcastle High Street by navigating my way though as much of Eldon Square as possible to keep out of the rain… Now however, I have a new reason to go. A reason that’s shot straight to the top of my list and that reason is Beckleberry’s café. Now hear me out. There are plenty of cafes all over town and pretty much all over in general. Well, although that may be true, do these cafes have award winning ice cream with endorsements from The Great Taste Awards, Anthony Worrall-Thompson or The Sunday Times? Because Beckleberry’s sure do. Do these cafes source and cook all their meals locally? Because again, Beckleberry’s do. Do these cafes charge you a fair price for a delicious filling meal? Because, you guessed it, Beckleberry’s do. Located in the Upper Blue Mall, Beckleberry’s is the perfect way to get a tasty meal followed by a multi-award winning dessert for your trouble. My wife and I decided to split a Panini between us before sampling the ice-cream that was on offer (it took a great deal of willpower to eat something savoury first… I am such a child). I’m so glad we decided to split our lunch as the serving size was really generous. A big ham, tomato and cheese panini, a large fresh salad and a sizeable portion of crisps were easily shared between the two of us. It was great to see. Clearly not content on being known for ice-cream alone, Beckleberry’s applies the same standards they have for dessert on their hot food menu. After the great panini adventure, I made sure to get myself to the ice cream (and sorbet) counter. I opted for a Geordie lemon sorbet with pineapple and coconut ice cream. There are bloggers, chefs and critics who have described Beckleberry’s desserts in much more depth and with much more eloquence so I’ll just say this: The lemon sorbet was amazingly refreshing, it had a real zing and a real flavour to it that I’ve never really tasted in a sorbet before. The pineapple and coconut ice cream was also full of flavour but also intensely smooth and creamy. 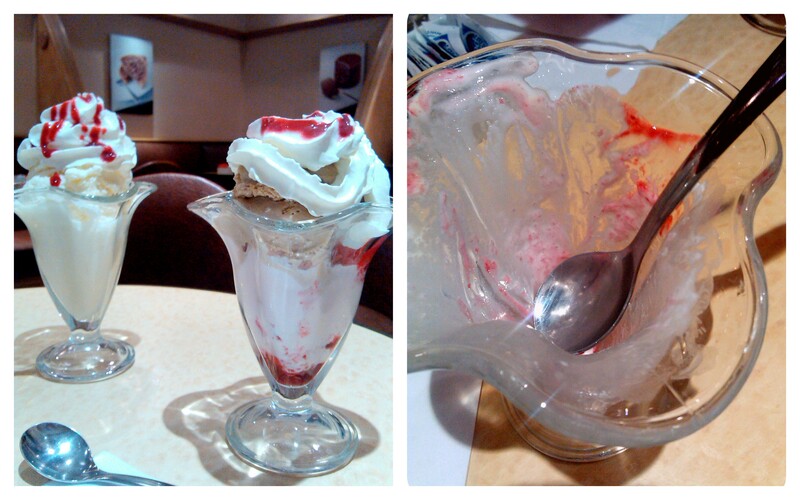 MrsJ got an ice cream sundae of Turkish delight and caramel ice cream. The Turkish delight had an intense, delicious flavour while the caramel wasn’t sickly or too sweet. The desserts speak for themselves and to be honest I’m not sure why I’m typing this when I could be driving back to the Metro Centre to sample a new flavour. All in all, in case you couldn’t already tell, I rate this café. Good food, awesome desserts and friendly and helpful service. Next time you’re hungry while on your next shopping excursion, drag the wife/kids/husband/friends/whoever-you’re-with to Beckleberry’s. I promise, if you do, next time they will be dragging you there. If you want to know more about Beckleberry’s check out their website, facebook, twitter and cafe. Also, click here for some vouchers to use in their café! Especially their fantastic ‘Credit Munch’ deal where you can get a sandwich, coffee and slice of cake for just £5 on weekdays after 5pm! Beckleberry’s can be found in the Upper Blue Mall, Metro Centre. I work within the Metro Centre and have never set foot in the place, definitely going to give it a try after this review!